I have had a high volume of messages lately from people whose sourdough bread is not working out. Some are old hands who seem to have lost their touch. Others are newbies who cannot seem to make it work. I think what is going on is that they are using a starter that is not refreshed enough to ferment their dough. 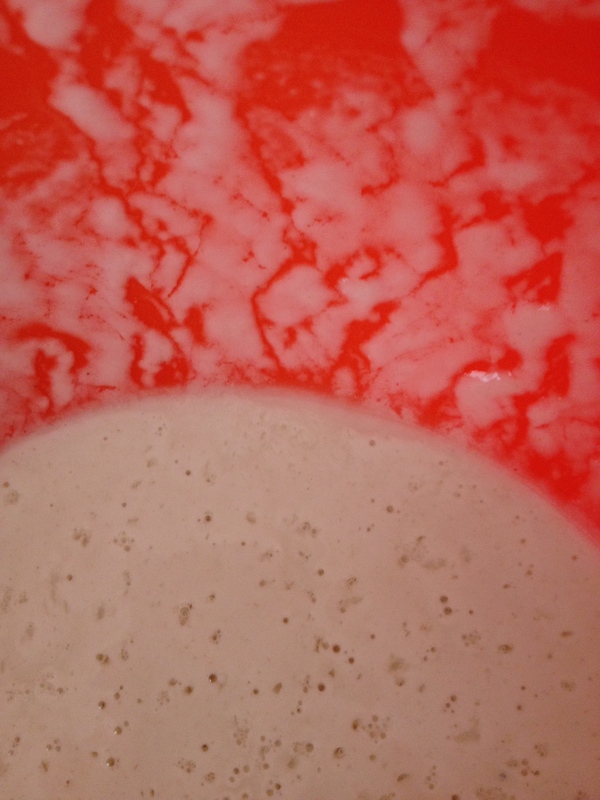 So, how do you know when your sourdough starter is ready? Sourdough baking is more about developing an understanding than developing knowledge. All the knowledge in the world sometimes does not help you. It takes time, effort, patience (and a lot of toast) to get to where you want to get to with sourdough bread. The main event is the starter because that is where the yeast is. It has to be bubbly and lively in order for it to be able to ferment dough for you to bake into bread. However, how bubby is bubbly? When do I know whether it's bubbly enough? Thankfully, you don't have to rely on a bubble count! Frothy on top = ready! However, it is not always easy to tell if your wheat starter is ready. When you first stir the starter (which I keep in the fridge) together with the flour and water a few bubbles may appear simply because there is air in the mix. 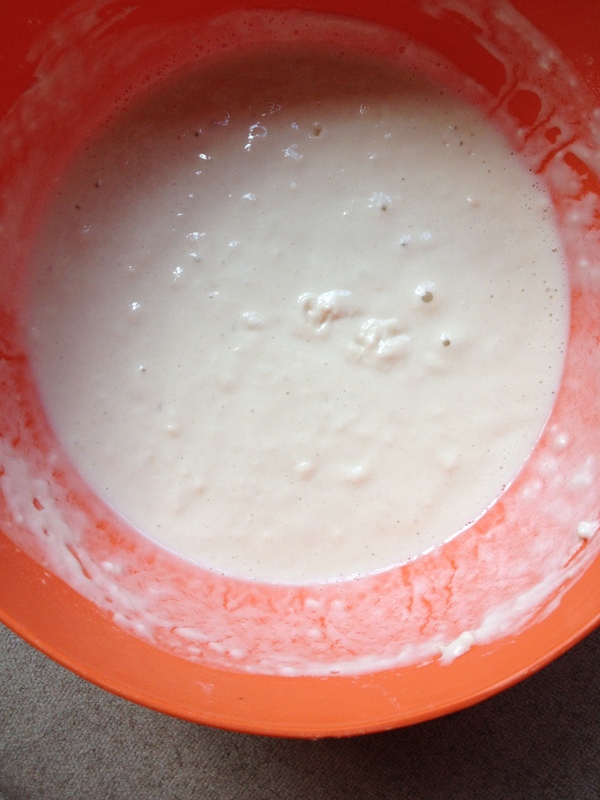 Starter, flour and water just stirred together. Wheat sourdough starter 24 hours after new flour and water added. It is never frothy, like the rye, but it should be bubbly. 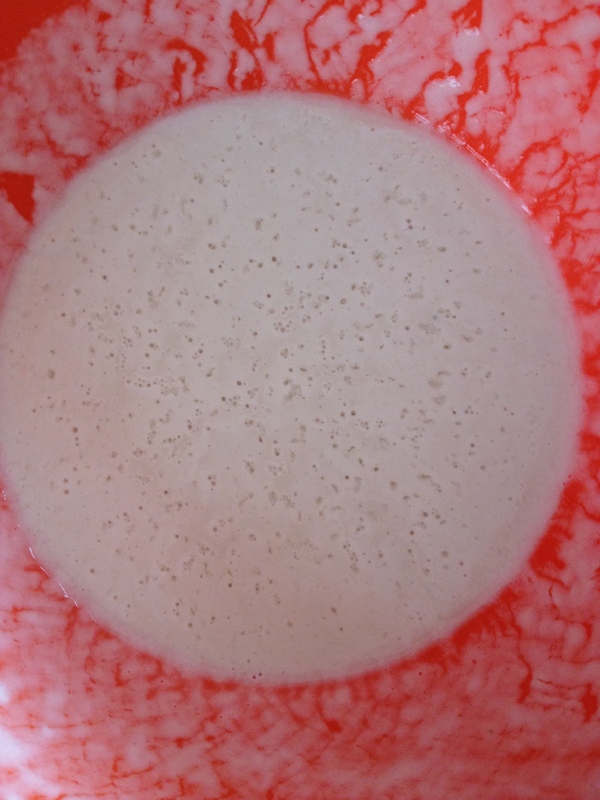 However, the bubbles do not necessarily indicate that the sourdough starter ready to use. In order to determine that with total accuracy, that your refreshed starter is ready to use, do the water test: Put a spoonful of your refreshed starter in a glass of water. If your refreshed starter floats, it is ready to use. If it floats, it's ready to use. If it sinks it is not ready OR you have left it too long and it's gone past its peak. Either way, it will not ferment your dough and the result will be a rather flat, worthy loaf. Never forget, even if it's ugly it's good toasted. You know your starter is sinking because it has gone past its peak (as opposed to simply not being ready) if the bowl of starter from which you have taken to spoonful to use in the float test has split or has completely separated so that there is a lake of water floating on the top. 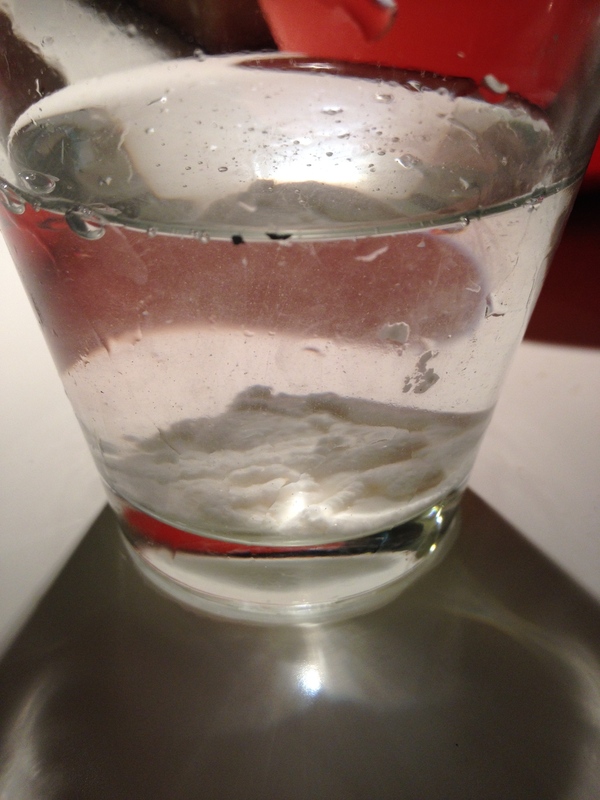 A little rim of water showing the starter is beginning to split and may be losing its puff. Do the float test to be sure. If your starter is not ready after 24 hours simply take some out and make ordinary bread (adding yeast to the mix) using the goo as a biga or poolish. Then, refresh the remainder again by weighing it and adding the same amount of flour and the same amount of water and covering it and leaving it for 12-24 hours. Do the float test again to check. If your starter is not ready again, do the same thing. Keep doing this (removing some, baking some normal bread, refreshing the rest) until your starter passes the float test. What you are doing is effectively making a new starter because, for whatever reason, your current one does not work very well. Always remember to make slightly more than you need so that you have some to put back in the fridge for the next time you want to bake. Baking sourdough bread is not inherently complicated although admittedly it is more complicated at first than baking with commercial yeast. It is simply that there are some sensitivities in making and using a starter that you need to learn and get used to and this takes some time. 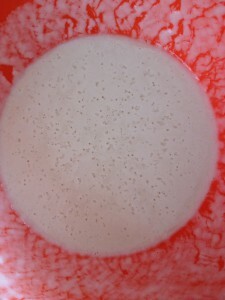 Remember that natural yeast is less powerful than commercial yeast and it is more sensitive to changes in temperature. Remember too that the refreshed starter is simply yeast trapped in a paste. That paste contributes the yeast (enabling the dough to rise) as well as the acidic flavour and chewy texture that comes with sourdough bread. It does not contribute flour as we understand it. That is to say, it does not contribute gluten that is strong enough to make dough stand up. The gluten in the flour that is in the refreshed starter is more or less all eaten up while the starter refreshes. What this means is that there is no strength in the paste to hold up the dough as it rises. Only the new flour will do that. To that end, there is a maximum ratio of refreshed starter to flour that you can use if you want your dough to stand up and bake into something that looks and tastes like bread, rather than collapse and look like solidified custard inside a crust. To learn more, take a one day sourdough course with us. You will learn a ton and have ample time in a small and cosy setting to ask all your questions, get your hands extremely sticky, and have plenty of delicious bread to take home. Love this! SO, I had a nice bubbly starter going and then I bought this new fancy dancy sprouted wheat flour and started feeding it to the starter, which seemed to kill it. What happened? Is it time to start over? Dear Michelle, thanks for the message. I have never heard of sprouted flour killing a starter. Never! This is a first and I am not sure what to say. Is it still in a state of collapse a few hours later or has it perked up? This is an excellent explanation. I actually have a rye starter and a sourdough starter, and I have been so confused as to why rye is frothy and wonderful while the wheat looks...bleh. I originally killed my sourdough, because I forgot about it in the fridge, and it started to actually smell sour and not fruity. This really helps me out. Hi there Beth and thanks for this. The smelling sour bit is perfectly normal. It really stinks when it's old. But it gets nice again when it gets new food! Hi, loved your page. I do have a question though. If my starter floats for a few seconds and then sinks is that a bad or good sign? Should I use it? This is my very first starter and I have no clue what I'm doing. Thanks. It is a white flour and wheat flour starter. If it sinks straight away, let it sit for a few more hours and then try again. It should really float. It's getting there! Love the float test! Have never heard of it before - thanks! 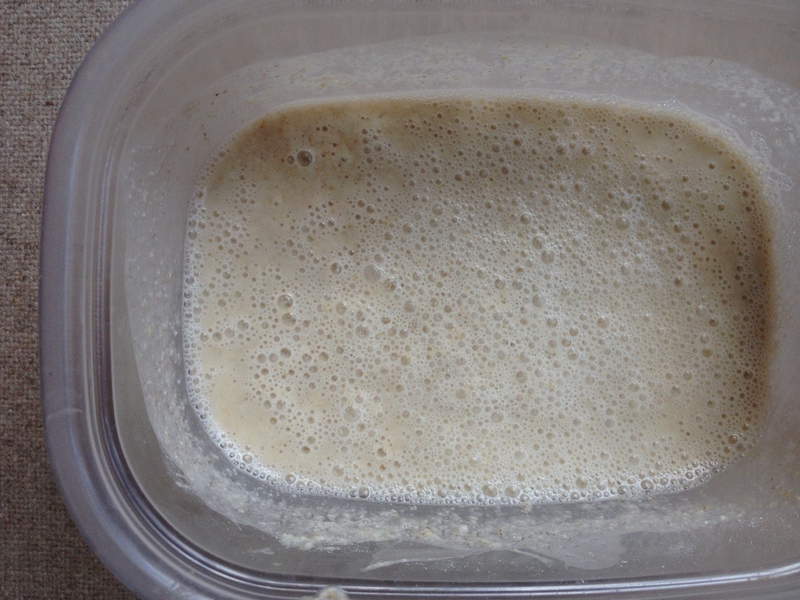 A refreshed starter will float - that indicates there is enough activity in it to actually make dough rise. So follow the steps that you did before (put what you don't need in the fridge or discard it) and wait for a few hours. After such a recent refreshment it won't take so long to be lively enough to float. Dear Allan, that is very odd. What grain is it and how have you made and fed it? Thanks! Hi there! I started making my starter on 12/29/16. I followed instructions from someone on Pinterest. 4oz of water to 4 oz of flour for the first 7 days. So mine should be ready tomorrow. I have mine in a big glass container. I just did the water test and it immediately sunk. It smells like sourdough, has bubbles but is still kind of thick. 7 days in in fact too long - 4 days is about right. I would (and I shudder to recommend this but I will) throw about most of it. How much do you need for your recipe? If it is, say, 6 oz, I would take 3 oz of your starter and mix it with 3 of water and 3 of flour and put it in a bowl. That is 9 oz. Cover the bowl with a plate and leave it overnight. It should pass the float test in the morning. Then take the 6 oz (or whatever and use it) and take th 3 oz and put it in a jar and put it in the fridge so you have some leftover to use the next time you want to bake. 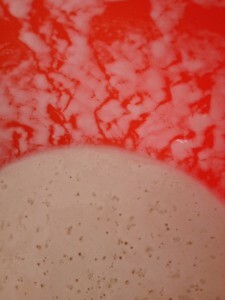 Look here: http://www.virtuousbread.com/bread-and-conversation/can-i-keep-my-sourdough-starter/ and have a read. it's kind of the "last phase" of the process but following the links you can work backward to the beginning! I hope this helps. Hi! What a great page. I've tried already 3 attempts to make sourdough prior to finding this web page. Getting better (the second attempt I came up with a new bread: rock bread LOL). I fed my starter last night around 7pm. I marked the level in the container (mark #1) By 11 pm it had risen about 1 inch and bubbly and I marked that level (#2), I use one of those plastic 1 qt containers. This morning it had come down to mark #1 but still bubbly. It passed the float test, so I'm making the dough right now. My question, should I have done it last night at 11 pm when it was at its "peak", or does it still work this morning because it floats? Thanks! THanks for this. I am glad it helped. Did you test it at 11? The main thing is as long as it floats, it works. Yes it did float at 11 last night. But I decided to wait till this morning, it dropped down in volume but still floated. I have the dough riding right now. My book says 2 hours. How long do you recommend for this first rise? Thanks again! My starter has been on the counter [kind of cold inside the house] for over a week or so, I use a screen to cover it. I feed it every 12 hours. It has lot of little bubbles, and smells good. 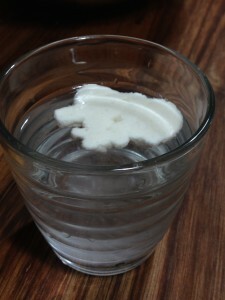 I tried putting a spoonful into a glass with room temp water, and it sunk to the bottom. I only used unbleached bread flour, and honey. I got one email from you. But I didn't see an answer, maybe I missed it. My Starter did float 2 day's ago. However, it's not floating now! Do you scrape the top to see it float, or do you mix it well then give it the float test? Also, my Starter doesn't have that sour smell. How can I make it more sour I do love that that sourdough taste? Your email was very helpful, and I believe my Sourdough Starter is ready to be put in the fridge. Question number 1. Do I put it in the fridge now while it's active or do I wait until it drops? Question number 2. I don't understand the part where they say don't put the lid on tight. Does that mean only turn the lid half ways? hi there, thank you for this beautiful site. i have had a starter and been making bread for about 4 years. i am wondering if its possible to use my wheat starter to make sweet breads, like beignets, doughnuts, cinnamon rolls? or are there specific times/reasons that you must use dry yeast instead of this wild starter? thanks! Dear Jen, Thank you so much for your lovely comment. It is absolutly possible to make sweet breads with that. You need to adjust timings a bit just because sourdough rises more slowly. Here is a recipe for sourdough hot cross buns, for example and in my book Perfecting Sourdough there are a couple of sweet bread recipes too. http://www.virtuousbread.com/bread-and-conversation/the-world-premiere-of-the-sourdough-hot-cross-bun-at-the-clink/ is the recipe. the starter is 100% hydrated wheat starter. Hi there, when it's cold, I put the starter in the oven with the light on! No heat - just the oven light. This makes it a perfect temperature. Try feeding it once again and pop it in there. You will see it spring to life! I'm new to sourdough making. I'm in Australia and about 2 weeks ago was in Tasmania and started my sourdough journey and all was going well - was relatively cold there. Now I am back in Perth where I live and it doesn't seem to be going so well. I am on day 6 of my starter and so far have had an absolute hype of activity I think due to the warmer weather. I didn't realise but I had my starter next to a bowl of apples on the counter so think they made it even more active. I had hooch which I poured off & started to feed my starter twice a day to keep up but now the morning of day 6 it is still not floating. It doesn't look split like you say. If it has been warm & super active can it still take a long time to be ready? The consistency is very runny I've been trying to give it more flour than water but it doesn't seem to make much of a difference. Any advice would be great. Thanks! hi there what ratio of flour: water are you using? You certainly don't need to feed it twice a day! Generally 1:1 for the most part (50g of each) have only altered by maybe 10g when it was going crazy. It is day 6 now and it seems to have calmed down a lot but I am still doing the water test and it is sinking. Consistency and bubbles look really good and the bubbles continue all day and as soon as it is fed. Moving it away from the apples has definitely made a difference so will probably go back to just one feed a day now. I tried a batch of bread this morning and it was super dense and doughy. I would have thought it would take longer to be ready in cold climate and quicker in hot? Does it seem feasible that it is still not ready after 6 days given very active yeast? that's fine. it is not going to float forever! I'm leaning much about rye starter but still confused. I've used a starter recipe that initially calls for 2c of rye and 2c of filtered water...then add 1 c rye flour ever 24 with enough water to make it soupy. I'm now on the morning of day seven. My starter looks way below the 6 qts I'm supposed to have. So I added more water( 1.5 c ) thismorning,t then did the floating test. Didn't pass. It's cold today so I've put a SS pot on the stove and will see if it gets foamy. It was a little foamy this morning before adding water. Can I save this starter? Recipe for rye starter at the bottom of the page and general guidance on using starters! Do come back if you have any issues! Hi Murial, not at all! You can use it straight away. Jut pop it in the fridge between uses - it falls asleep there. Hi there, please tell me more about the recipe. I don't know it. Unless you are making a sourdough baguette (where you need refreshed sourdough) most baguettes are not sourdough necessarily. That means that you have the poolish (mix of flour, water, yeast) that you put together 12-24 hours ahead of time and then you add more flour, water, salt AND more yeast. So, please send along the recipe and I can help you out. Sorry this is probably not the right forum for this but wondered if anyone could help me. I've had my starter going for quite a few months now and had no problems at all except a few weeks ago I went away so I put my starter in the fridge and when I returned I took it out however my starter has never been the same since. I've tried to throw most away but as it builds it just is the same weirdness. The changes I've noticed are firstly the smell, it doesn't seem to have the 'sour' smell to it anymore it smells different and not as 'palatable' on the nose. It tastes different- again the same that it doesn't have the sour tang and is a little more funky tasting. And I've tried baking a few loaves of bread and I don't get a good rise anymore, it seems a lot flatter but the bread still tastes ok. In the glass container I still have good bubble action but these other changes have just disturbed me a little. I've tried throwing most of the starter out and starting from a small amount again but it just grows back the same. Should I just start again from scratch? Any suggestions would be amazing! Hi Belinda this is exactly the right forum. I refrigerate my starter all the time. Is it a wheat or a rye starter? This is important for the refreshment. If wheat, you take equal amounts in weight of the starter from the fridge, wheat flour, and water. Mix and leave on the counter for 12-24 hours depending on how long it's been dormant. If it's been dormant for a long time you may need to use some of that starter to bake bread, adding some yeast, and then weigh what is left and add the same amounts of flour and water. Always do a float test to make sure it's ready to use. Let me kow if this helps. Quite a newby in sourdough bread here.... I have made a few loaves that were great taste wise but did not rise. I did not know about the float test - will try that next time. The last loaf had a nice dough but the dough after proofing was really wet. Any thoughts? Overproofing maybe? Hello.....I am going away for trips often. I was wondering how to feed the starter in this case. Can the starter be left in the freezer? Hello, just pop your starter in an air tight container in the fridge. It will go to sleep. WHen you return, refresh it in your normal way and expect it to take 12 hours or so to refresh. Hello, I am not sure what you mean by wet - do you have a photo? Overproofing causes the dough to collapse and the crust and crumb to separate - but doe not cause it to be wet. WIth your starter, well, mine is liquid but others' have a solid starter. what have you changed about feeding it? I made a new starter and its sitting out for about 6 days now? When do i test starter to see if it's floating? After I feed it Or anytime even if it's sitting for 15 hours and it's not right I after I fed it? Once your starter is alive, you don't have to keep feeding it forever. You can put it in the fridge and pull it out to refresh it 12 hours before you want to use it. Please see here: http://www.virtuousbread.com/bread-and-conversation/making-sourdough-starters/. At that point you test it to see if it passes the float test. Don't test it right after you have fed it. If your starter is new and has been fed consistently, test it about 8 hours after you next feed it. If you are still confused, please come and take our sourdough course: http://www.breadangels.com/courses/ you will learn loads and be able to bake with confidence! Hi there, sorry I did not respond earlier. 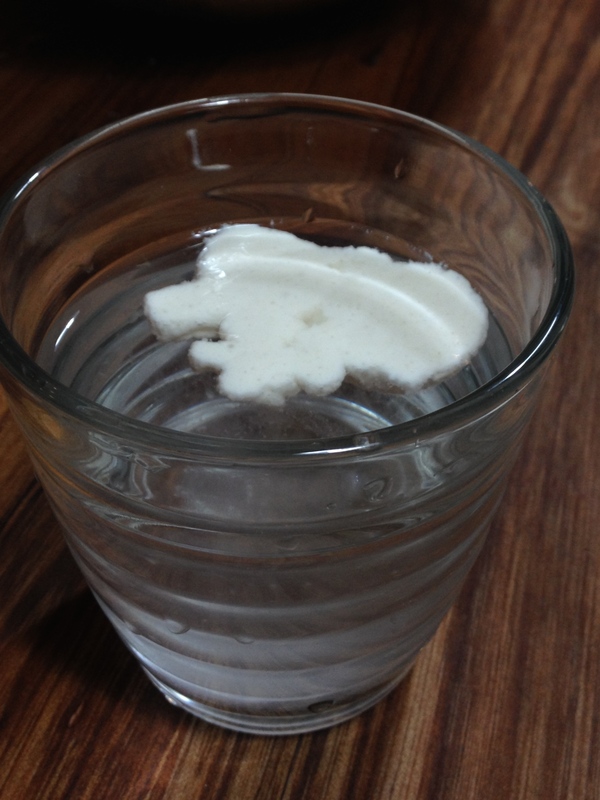 It will not pass the float test until it is fully formed - on day 5 it should pass. You could be "missing" it - as in it bubbles up and then by the time you check it, it's died back. Thoughts? I have some starter I've been using every week, for the last several months. It makes some great sourdough bread, but my starter has been acting weird. I make it and put it on top of the stove for 12 hours. I set the temp on warm. The last few times I've fed it, no bubbles. This time I looked, the starter separated, like it had been in the refer for a week. Is something wrong ? I have never put the stove on - is this what you normally do? Separating either means it dies (is there mould? does it smell) or has gone to sleep. I would just put on the stove without any heat - just at room temp. Only when it's really REALLY cold do I put it in the oven - no heat - just the oven light for warmth. Other than that, I just leave it on the counter.